settle in, folks, today’s post is a long one! in anticipation of our honeymoon to quebec city, canada now just 5 days away (!!! 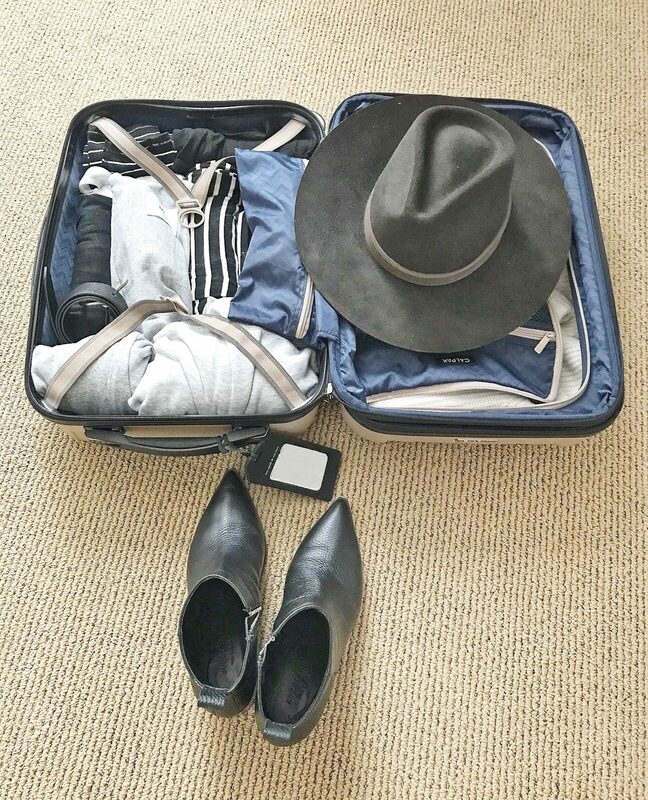 ), i’m giving you a sneak peek into my suitcase, sharing everything i’m bringing for our 12-day stay, my strategy in packing said items, and a glimpse into some of the activities we plan on doing while we’re there. i will start off by saying that i’m a notorious over-packer. i’m not only a girl who likes options, but one who likes to be prepared in any/all situations. so given that combination, i tend to bring WAY more than needed on any given trip. 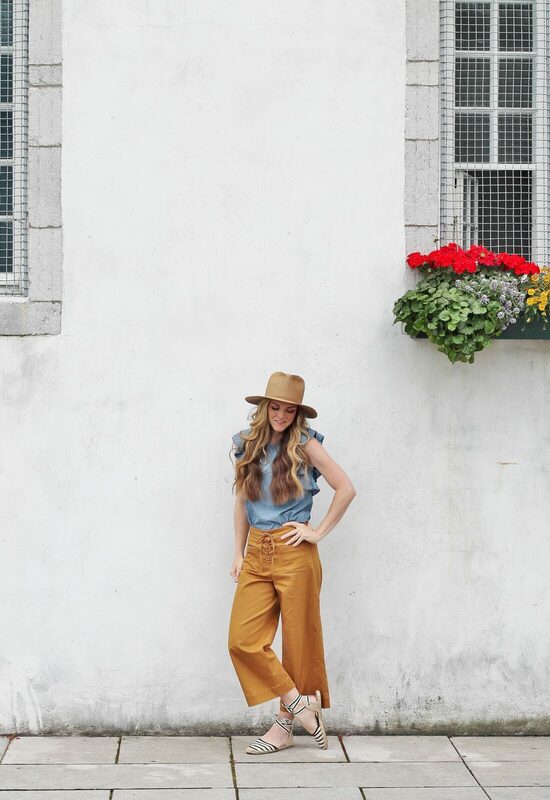 over the last few years as my trips became more frequent, i learned to pare down my travel wardrobes, sticking to common color palettes for easy mixing and matching. for this particular trip, a bulk of my items are blue and white (surprise, surprise). i’ve also mixed in a few black, white, and rust-colored pieces for variety. i’ve found it much easier to make outfits once i get to my destination when most everything can be paired together a few different ways. one of the first things i do in my packing prep is check the local weather of our destination. currently it looks pretty mild with temperatures ranging in the mid to high 70’s. there are some pesky showers forecasted, but they look intermittent and warm, like the kind you’d find on a humid day in the south or in hawaii. with that said, i will be cognizant of what shoes i wear on the days with possible rain (since espadrilles are no match for water) and be sure to grab my denim jacket and one of the hotel’s umbrellas just in case. lucky for us, there are plenty of museums to duck inside should one of the days be a rainy one. speaking of museums and other activities of interest. after doing extensive research over the last few months, i’ve discovered there’s quite a lot to do in the quaint french-canadian town. 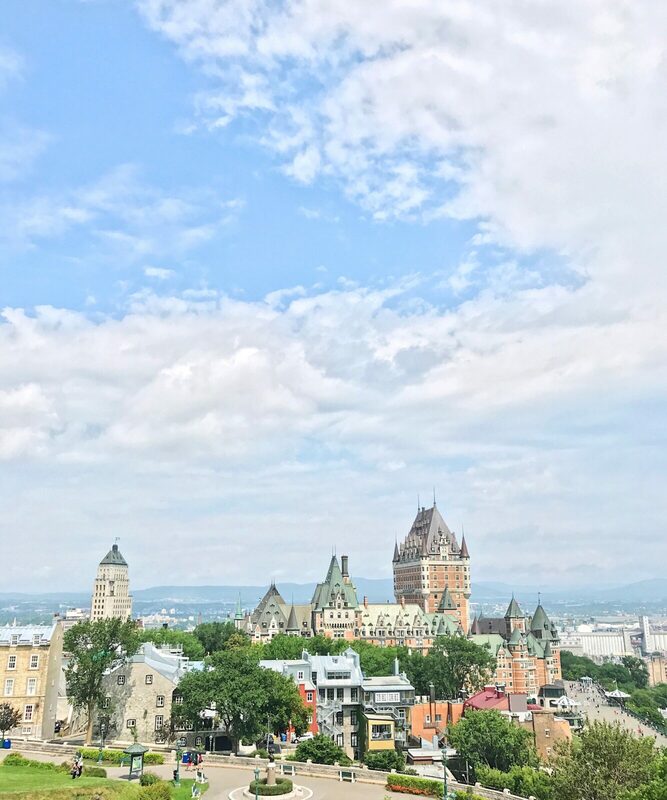 from wandering the famed rue du petit-champlain and admiring its many sidewalk cafes and boutiques to taking a trip out to montmorency falls for a hike and an afternoon picnic, we’re bound to log a lot of mileage and spend a bulk of our time outdoors. 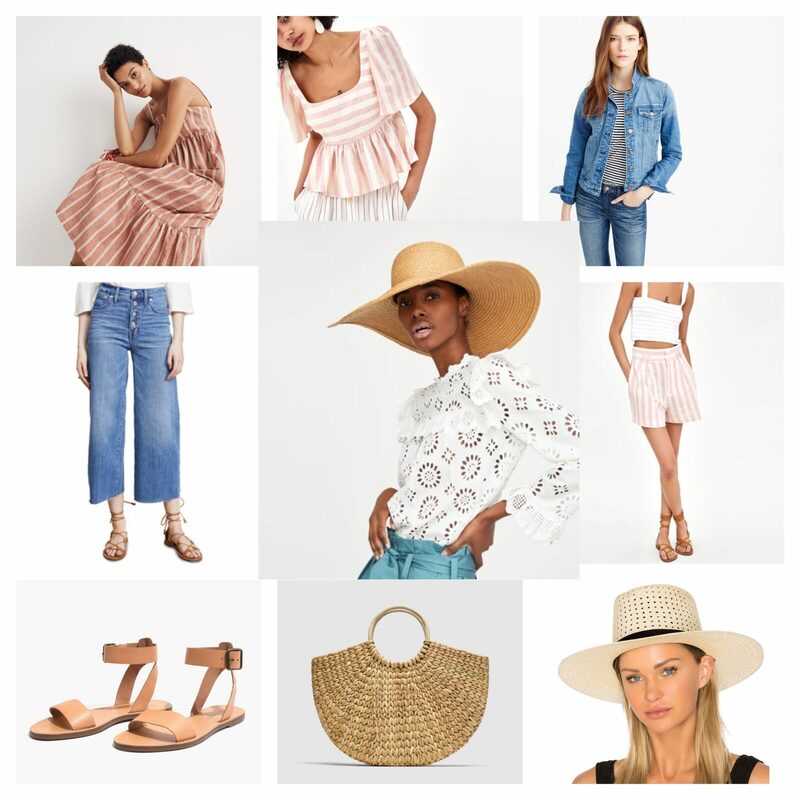 with those aspects in mind, i focused on selecting pieces that i know i’ll not only feel comfortable in, but will keep me cool in the summer sun. i also noted in this post that i’ll be foregoing heels since they’re not as conducive to navigating cobblestone streets. so with ALL of that said, let’s get to the good stuff, the clothes! i tried to keep my tops as neutral as possible for easy mixing and matching. i snagged these tanks from loft a couple summers ago and aside from stretching out a touch after a few wears (they’re a jersey knit which tends to do that from time to time), they are literally the most perfect sleeveless shirt. if they ever come back, i’ll be sure to stock up! i figured the both the polka dot cami and bow-back tank could be dressed up or down depending on the occasion and considering the forecasted humidity levels, they will also be good in the heat. a simple white tee and a chambray shirt are always musts on my packing list for their versatility and this one is full of character with the oversized ruffled sleeves (it runs big, so size down!). finally, the off-the-shoulder top is just a fun novelty item that photographs well (#doitforthegram) and still complies with my overall color palette. if there’s any place i usually tend to overpack a little, it’s with my tops. but i figure if i want to change up my look from day to night, i’ll can easily do so by simply swapping out my shirt and perhaps opting for a different accessory. unlike tops, i tend to bring less pants/skirts/shorts options since they can be more easily interchanged. 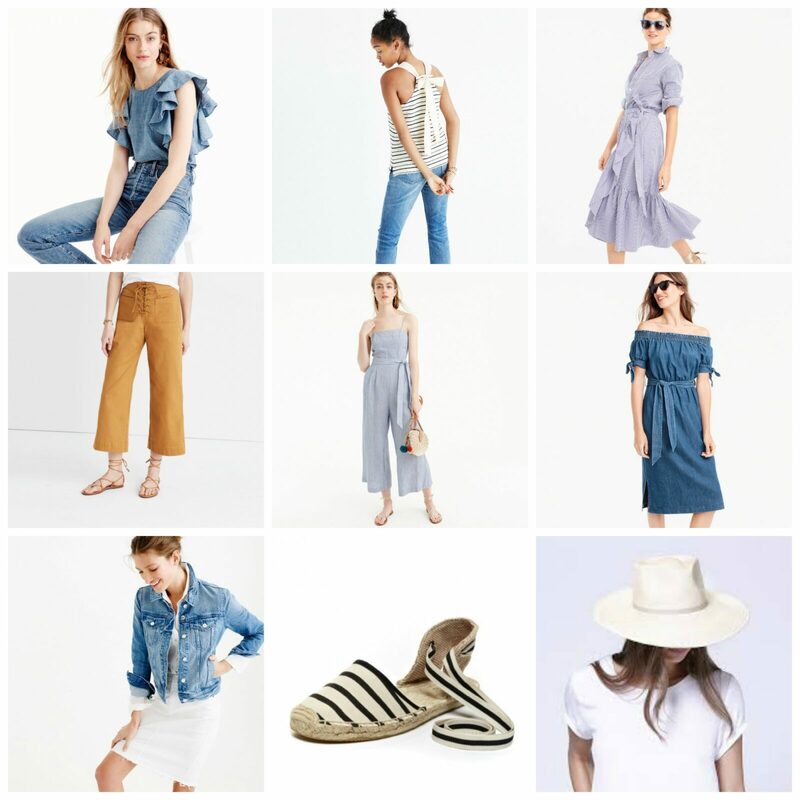 the scattered rain is kind of throwing me for a little loop so i’ve packed a few extra pant options than i might normally on a summer vacation. at any rate, i’ll be able to mix and match quite a bit. 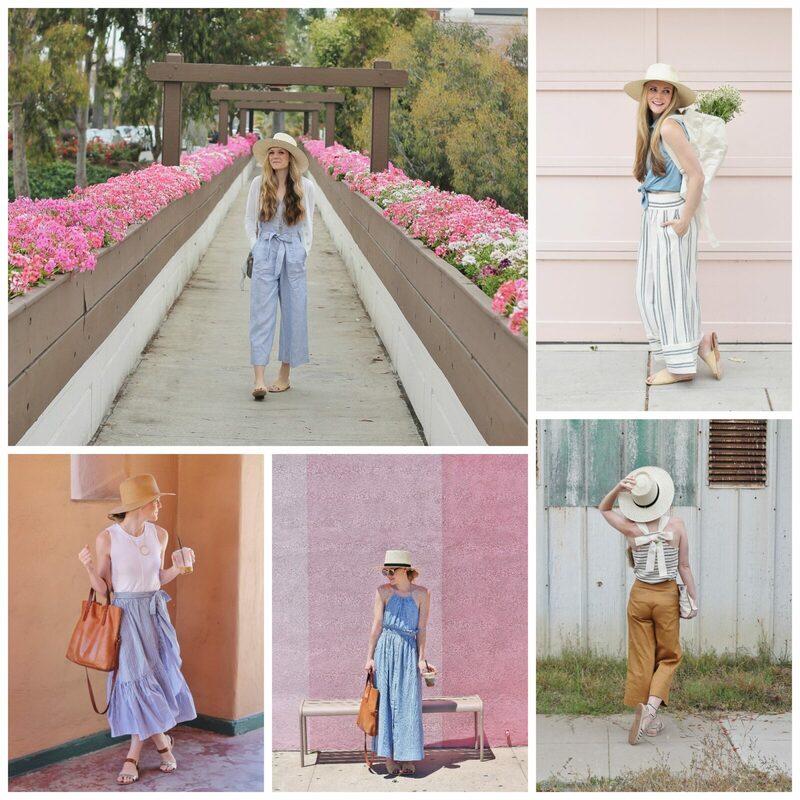 sample outfits include: this chambray top with these shorts or these similar pants, this linen button-down or this similar silk cami with these similar black crops, and this similar white tee with this wrap skirt or these lace-up crops. these are pretty self-explanatory -dresses and jumpsuits are some of the easiest pieces to pack for vacation. 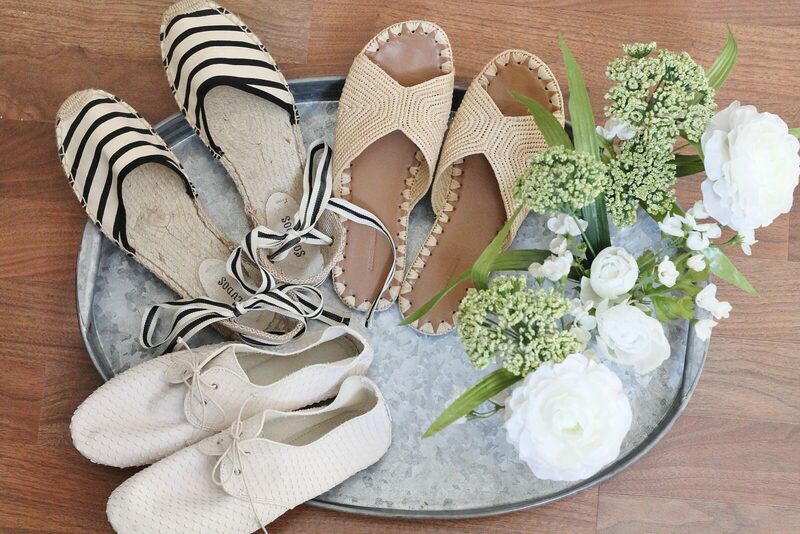 just slip them on, and go! personally, i’m pretty proud of the dress collection i’ve formed over the past few months and i really can’t wait to wear each and every one of these piece as we gallivant about the city. aside from doing a few studio barre moves in the hotel room (maybe some plank? ), i don’t really plan on “working out” in a traditional sense while we’re there. i know we’ll be doing enough walking, bike riding, and exploring by foot to keep up my fitness. but for those mornings where we want to do a quick coffee run to the local cafe and most certainly for our picnic to the waterfalls, i wanted to be sure i brought a couple pieces of athleisure wear. as i mentioned in this post, i really tried to pare down my footwear options. i did add in a second pair of sandals since the straw ones probably shouldn’t be worn in anything heavier than a sprinkle and the running shoes are for that hike out to the waterfalls. most importantly all five pairs are extremely comfortable and light-weight meaning they barely take up any room in my suitcase! accessories complete any look so i’m making sure i bring plenty of them! of course most looks don’t feel complete without a piece of natalie borton jewelry, so in addition to the two items listed above, i’m also plan on bringing a couple more necklaces as well as these newest white and silver tassel earrings. 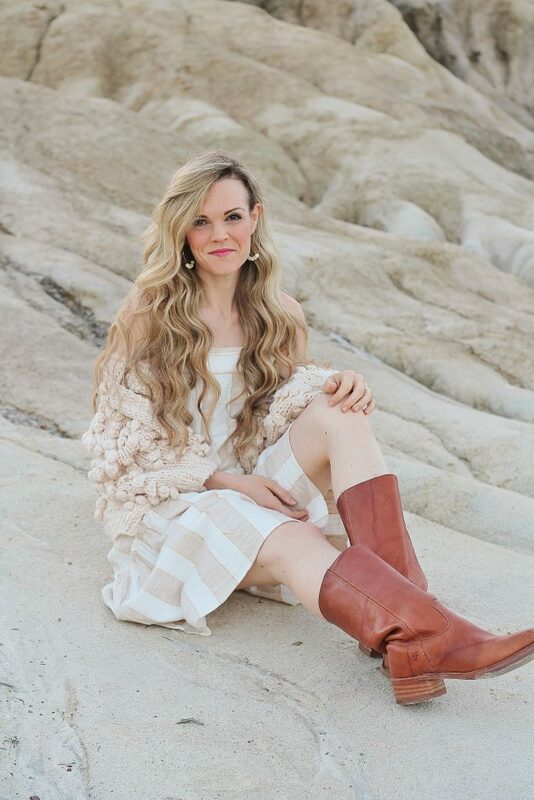 natalie is constantly updating her shop with new pieces so be sure to check back for a peek at her latest arrivals. whenever i travel, i always downsize my purse to a crossbody bag since it’s so much more convenient when we’re out and about exploring a new city. both bags also have zip closures which i particularly appreciate since it ensures everything stays secure in transit. finally, hats. you didn’t think i’d go all the way to canada without a couple of summer chapeaus, did you? between the possible inclement weather and vacation laziness, hats are my best defense at hiding dirty/unstyled hair while still looking chic. see my hat-packing strategy below. side note: i’m also bringing a couple pairs of pajamas -including these striped pants that are the comfiest ones i own and this bikini. bring extra underwear. it takes up essentially no room and it’s always good to have an extra pair or five around if needed. roll your clothes. i’m fairly certain this tip is hardly groundbreaking, but rolling my clothes (as opposed to folding them and/or stacking them) has revolutionized how i pack a suitcase. not only does it free up extra room, but it’s also great for preventing wrinkles. pack your hat upside down. as you’re well aware, my obsession for hats is at an all-time high so of COURSE i’ll be bringing a hat or two with us to quebec. since straw hats are particularly delicate, i’ll want to be sure i pack them strategically. the best advice i’ve ever read (and later employed) is to pack it upside down, with the crown of the hat facing toward the bottom of your suitcase, and the bottom of the brim facing up. to ensure the brim stays flat, surround the bottom of the hat with clothing to keep it balanced and fill the inside of the hat with extra clothing -like underwear or socks. 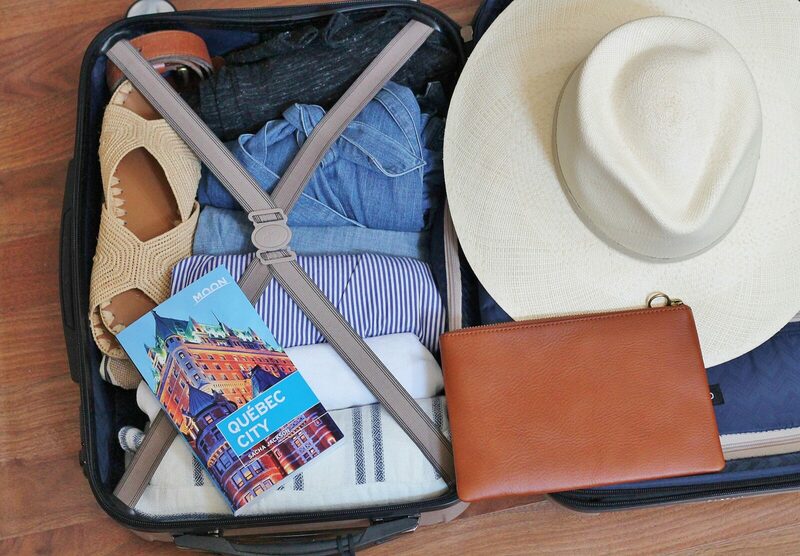 leave room for souvenirs. it’s easy to use every square inch of your suitcase, but i always like to leave a little room to bring home any goodies either as souvenirs to commemorate our trip or as gifts for family and friends. bring snacks. given my dietary restrictions, eating while on vacation can always be a little tricky -especially in a location whose cuisine focuses around lots of bread and cheese (being gluten-free and dairy-free is sometimes the worst). so i’m making sure to bring a few snacks i can stow away in a backpack should i need something in a pinch. rx bars are great because they don’t need to be refrigerated (unlike my beloved perfect bars) and trader joe’s individual-size raw almond packs are always a staple in our home. i’m also bringing a big bag of stevia for my morning (and probably afternoon) coffees just in case the cafes don’t have any on hand. take advantage of your husband’s extra luggage space. 9/10 when we travel, my husband has leftover space in his suitcase. i swear men’s clothes are just more compact (or maybe he’s just better at packing than i am). at any rate, having the extra real estate is always helpful when planning your packing strategy. oftentimes we use his carry-on to pack our camera, its extra batteries, and even a couple pairs of my shoes. i’ll be sharing the outfit i plan on wearing for a full day of plane travel on wednesday, so be sure to check back then! Nice post. I’m sure your honeytrip will be wonderful.